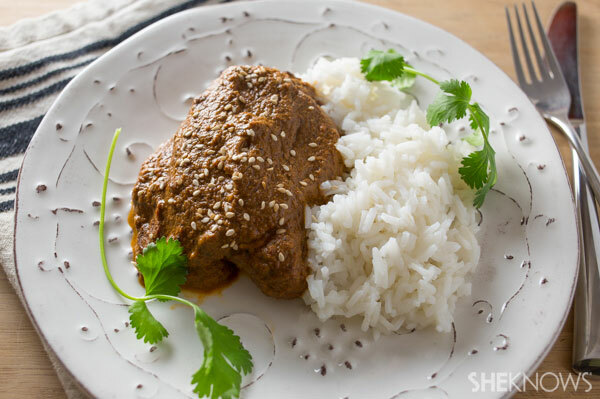 A weeknight version of chicken mole, the traditional and celebratory Mexican dish. Mole is partly known for its special ingredient — chocolate — and partly for the laborious process often involved in its creation. The steps taken to create this sauce add layers of flavor and richness fit for a celebration. This recipe cuts back on the number of steps and ingredients but still results in a deep, satisfying sauce in which to cook or serve alongside chicken. The savory dish includes chocolate, cinnamon and cloves as well as chiles, nuts and onion. It is definitively savory with a kick of heat and pairs beautifully with refreshing, herbaceous cilantro. 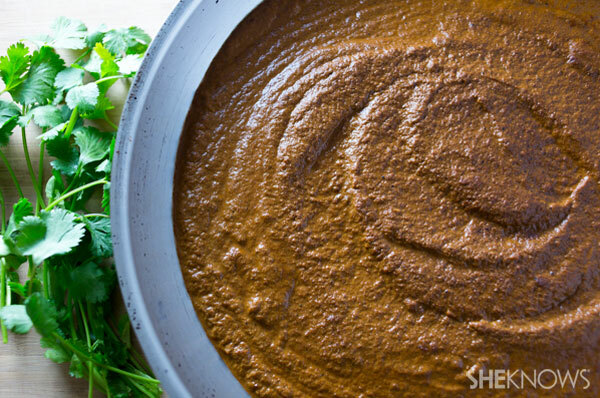 Rich and spicy, this mole sauce requires just enough steps to command complexity but not enough to keep you in the kitchen all day. Preheat the broiler. 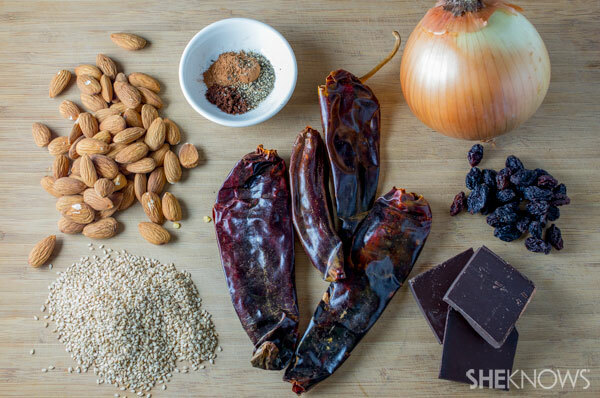 Spread the chiles, almonds, sesame seeds and onion evenly on a baking sheet and place under the broiler until just beginning to char in places. Move the ingredients to the bowl of a food processor or blender. Add the cinnamon, pepper, cloves and raisins to the charred ingredients. Pour in the simmering chicken stock. Let sit for 10 minutes, then add the chocolate and canned tomatoes in their juices and process until smooth. Preheat the oven to 350 degrees F. Pour the sauce into a large skillet over medium heat. Simmer for about 10 minutes. Season the chicken breasts generously with salt and pepper and nestle them into the sauce. Move the skillet to the oven and bake until the chicken is cooked through, about 30 minutes. Garnish each serving with a handful of cilantro and serve warm alongside rice.